Officials have confirmed the FBI and New Jersey State Police will take the lead in investigating what appears to have been a plot to bomb a Marine Corps run along the boardwalk in Seaside Park Saturday morning. Streets across Seaside Park continue to be shut down, as well as the beach and boardwalk area. 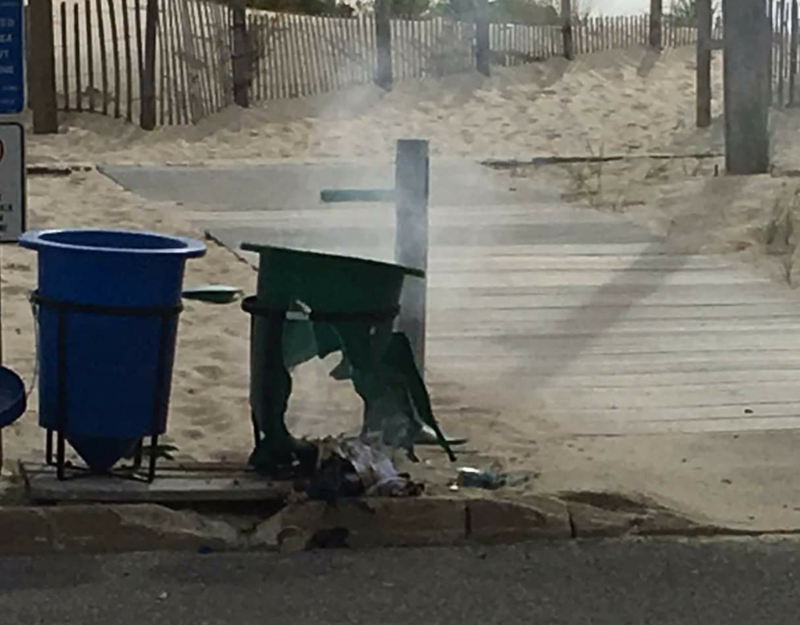 Al Della Fave, spokesman for the Ocean County Prosecutor’s Office, said bomb-sniffing dogs are continuing to check the entire boardwalk, especially garbage cans and other crevices. What was reportedly a pipe bomb exploded in a garbage can at D Street and the boardwalk at about 9:30 a.m. Saturday. Della Fave said there were no injuries since the race, the Semper Five, had been delayed. The race was delayed because of a higher-than-expected turnout, he said, contrary to early reports that a suspicious backpack had been found. “They had a tremendous number of people at the registration desk, which delayed the event,” said Della Fave. Della Fave, in an impromptu address to members of the media gathered near the scene, said only one device detonated. There were reports of additional explosive devices found, however he said that is still being investigated. “If there are any other devices, it’s all been contained,” Della Fave said. Police have cordoned off all streets within a four block radius of D Street, and have evacuated some residents in the area. 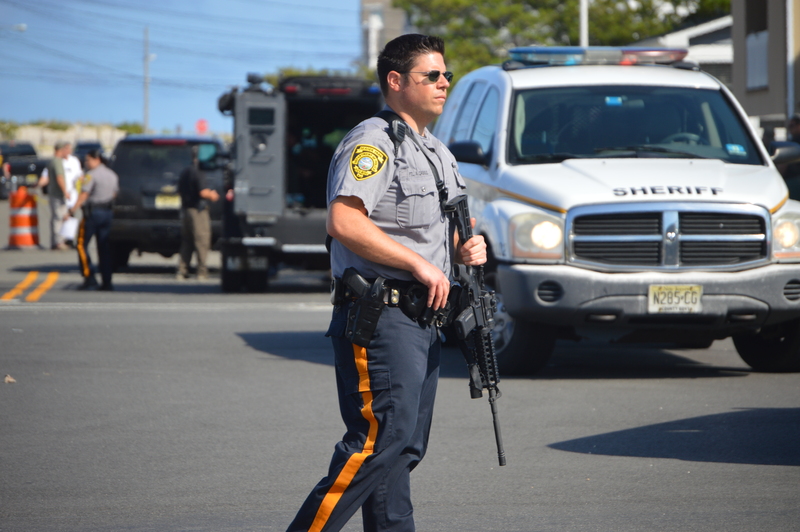 In nearby Seaside Heights, a barbecue festival was still going on, however authorities were taking extra precautions to ensure the safety of those attending. 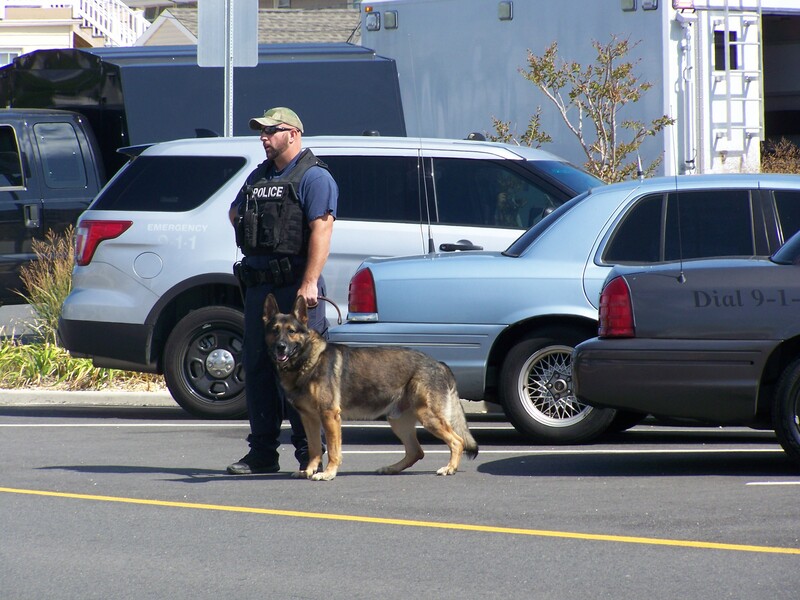 “They have dogs down there doing sweeps, to make sure everything is safe in that area,” Della Fave said. Bob Johnson, of North East Central Avenue and C Street, Seaside Park heard a loud noise just blocks away from his home around 8:30 this morning, His neighbor Dale Hodgens was walking her dog at the time and heard it as well. “We are staying here until we are asked to leave but we were told to go inside,” Hogens said. Former US Marine Jewff Cordero and his wife who live on J and Central Avenue said he heard the loud noise from the small explosion that occurred where the running route for the morning event was to occur. “A blue back pack was seen shortly afterward near the Saw Mill and we were all asked to leae the area. No one had claimed it and we don’t know if anything dangerous was inside it,” Lois Cordero said. Jessica Sadowski of C Street took a photo of the damaged trash receptacle shortly after it exploded. Like many residents on the scene, they were observing the influx of law enforcement officers from agencies around the county and state and the State Police helicopter that was buzzing around the borough near the command post between J and C Street on Central Avenue. Authorities would not comment on any suspects in the case. There were unconfirmed reports that two suspicious men were seen near trash cans early Saturday morning. Della Fave said police are working to obtain surveillance video to determine who was responsible. The investigation, he said, would be led by the FBI. That agency is planning a media briefing within the hour. Additional reporting in this story was by Bob Vosseller.